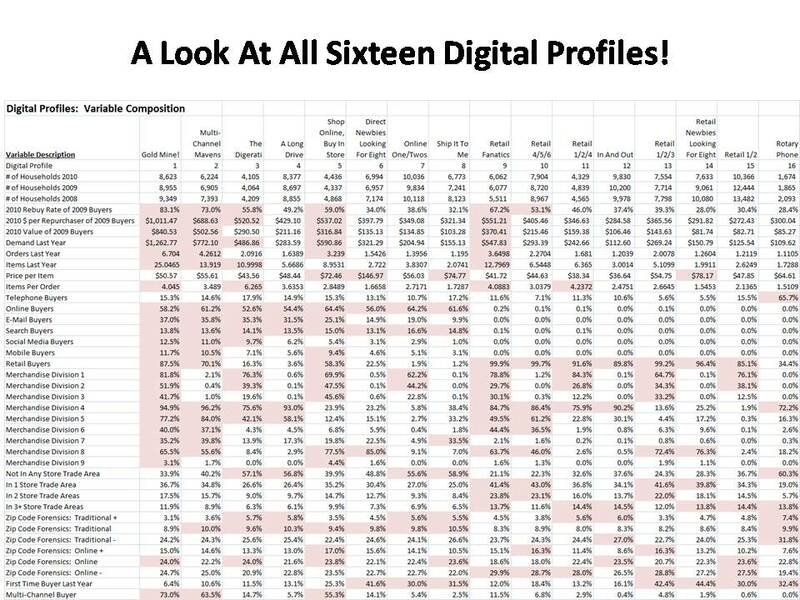 We're halfway through our evaluation of all sixteen Digital Profiles. Here's a description of profiles nine through twelve. Digital Profile #9 = "Retail Fanatics". In our "multi-channel" obsessed marketing environment, we seldom praise the customer that spends a boatload of money with us in just one channel. That's a shame, folks. With $548 of expected spend in the next twelve months, Retail Fanatics are the fifth-most productive profile in our analysis. 99.9% of these customers shop in stores, and only 11.5% shopped multiple channels last year. In other words, these customers love stores, and they spend a lot of money in stores. Take a look at the merchandise divisions that the customers purchase from ... all but divisions seven and nine. 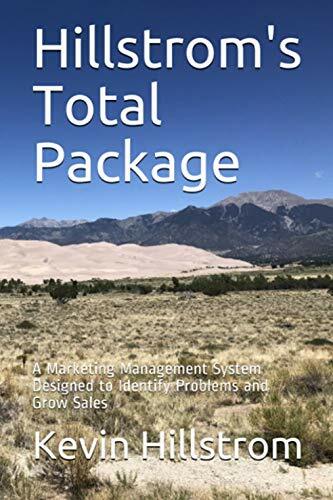 Remember, I mentioned in earlier posts that customers buying from a robust cross-section of merchandise divisions are generally more productive than are customers buying across multiple marketing channels ... this theme continues to play out in this analysis! 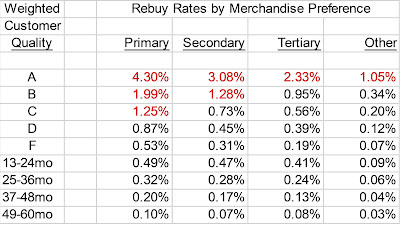 Also notice that these customers are likely to live in multiple retail store trade areas. When you have customers who live near multiple stores, it becomes more and more difficult to get the customer to buy from online channels. This doesn't mean that the customer doesn't use multiple online channels, s/he is simply less likely to buy from online channels. Digital Profile #10 = "Retail 4/5/6". This Digital Profile will spend $293 in the next twelve months, just a bit above average. Their preference is in merchandise divisions four, five, and six, and they also tend to like merchandise division eight a bit. These customers are likely to reside in the trade areas of one or two stores. In all, these customers are very "average", with a specific merchandise preference. Digital Profile #11 = "Retail 1/2/4". This Digital Profile will spend $243 in the next twelve months, and is generally similar to "Retail 4/5/6" except for the fact that these customers prefer a different combination of merchandise divisions. Nine out of ten customers in this profile shop in stores, and these customers are more likely than average to live in at least three retail trade areas. Digital Profile #12 = "In And Out". Oh boy, we're about to get a preview of the portion of the customer base that doesn't shop much. These customers bought 1.2 times last year, and 90% of the customers purchased in retail stores, probably because these customers are more likely to live in zip codes that comprise three or more retail trade areas. 90% of these customers purchased from merchandise division four. In other words, these customers come into the store to buy from merchandise division four, and then they leave. In the next twelve months, these customers will spend just $106, less than half the overall average. Twelve Digital Profiles have been described, we have just four to go. 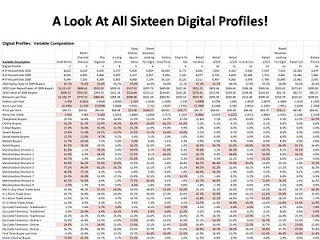 Up next ... Digital Profiles thirteen, fourteen, fifteen, and sixteen.